Beatrice Lumpkin is a long time Chicago Communist Party USA activist. She is the wife of Frank Lumpkin and the mother of John Lumpkin. After many years of blue-collar work in laundries, machine shops and assembly lines, Lumpkin became a technical writer and later an accredited math teacher. Lumpkin devoted time to researching and writing articles about ancient Egyptian mathematics, among other subjects, in an effort to balance the prevailing Eurocentric bias in teaching of math and science. Lumpkin is currently a Chicago delegate to the National Executive Board of the Coalition of Labor Union Women. She is on the executive board of Illinois Alliance for Retired Americans, the South Chicago chapter of SOAR, Steelworkers Organization of Active Retirees, a delegate to the House of Representatives of the Chicago Teachers Union and a member of Citizen Action – IL Policy Council. She has served as a multicultural consultant to textbook publishers and to public schools in Chicago, Detroit, Milwaukee, and Portland, OR. In 1973, seven women activists from seven different unions put out the idea of a union women's coalition. The seven included m Addie Wyatt, a packinghouse workers' leader; Clara Day, a Teamsters Union leader; and Florence Criley, an electrical workers' leader. Soon they were joined by Barbara Merrill, a welfare worker and a founder of Black Labor Leaders of Chicago. Their work culminated in a national convention to form a "Coalition of Labor Union Women" . The convention opened in Chicago on March 22, 1974. Beatrice Lumpkin, of Chicago, was on a May 2, 1985 mailing list for Chicago Women for Racial and Economic Equality - a front for the Communist Party USA. Greetings were sent from Bea Lumpkin and Frank Lumpkin of Illinois. A special award went to Evelina Alarcon, co-ordinator of the Cesar E. Chavez National Holiday. The next month (March) they brought a busload of protesters to a demonstration against Peoples Gas, a company owned by Peoples Energy. The company claimed they were not profiting from the rise in gas prices. At a later date, the Illinois attorney general proved the company had lied. Peoples Gas was forced to pay back the overcharge to their gas customers. On March 30 2002 the Communist Party USA paper People’s Weekly World called for a national holiday in honor of late Farm Workers Union leader Cesar Chavez. The article was followed by a long list of endorsersincluding Bea Lumpkin, Almost all endorsers were confirmed members of the Communist Party USA. In 2006 Bea Lumpkin was a leader of Illinois Alliance for Retired Americans. Honoring Committee members included Bea Lumpkin and Frank Lumpkin. Bea Lumpkin has been a longtime supporter and a fan of Barack Obama. Sadly, when Washington died in office, the Democratic Party hacks crept back into power. The movement around Harold had not had time to jell into an organization with staying power. Still, the lessons of that campaign, with its spirit of African American, Latino and labor unity, took deep root in Chicago. Those roots nourished the spectacular rise of a new voice for people's unity, Barack Obama. Since then, Obama's strong voice has brought the message of unity to every corner of the country. I am sure that Frank and I met Obama in the '80s. That's when he was working on pollution problems at the Altgeld Gardens public housing. The site was close to the steel mills, and Frank was active on similar pollution issues. We certainly knew the community people with whom Obama was working. But I cannot say that we knew the Obama name then. There were two reasons for that. Both Frank and I have a hard time remembering names. More important, was Obama's style. He pushed the community people forward and stayed out of the limelight himself. After Obama became our state senator in 1996, we knew his name, and I am sure he knew ours. During Obama's years in the Illinois Senate, we heard many good things about him. 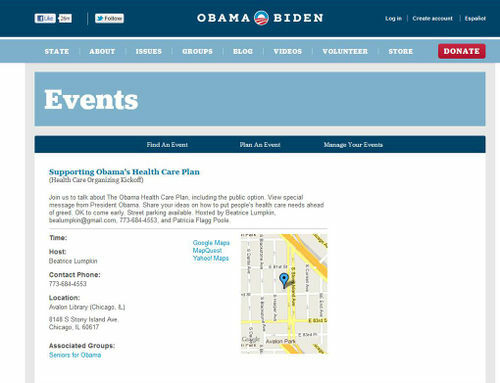 I helped organize steel worker retirees to visit Obama about health care legislation. He made us happy by telling us he was a sponsor of the legislation we wanted. And we liked his stand against a U.S. invasion of Iraq. He told us he was thinking of running for the US Senate. About that time in the campaign, I heard Michelle Obama for the first time. Barack Obama introduced her in a way that really appealed to me. It showed not only his love for his wife but also his respect for women. "I want to introduce my wife, Michelle. She is taller than I am, smarter, and better looking." Michelle Obama then took the podium and gave a good, progressive review of the issues we care about. The stakes were high. To win, each one of us had to do more than we could. But Frank was 88 and I was 86. Sure, we were in good shape "for our age." But how good was that? Well we found out. We worked and we worked and worked. And we did a lot of worrying, too. The polls kept teetering back and forth...As it was, he won the nomination in a landslide, 29 percent higher than his nearest Democratic opponent. With Obama safely nominated, we relaxed just a little. We no longer had to dream the impossible dream. But nobody knew how much racism might cut into Obama's vote. It takes a huge supermajority in Chicago to offset the Republican counties in southern Illinois. So once more we needed to work on voter registration. But Frank and I could not continue the pace of the primary election. We did not have to. Many new activists came forward. I was ecstatic when Barack Obama put his name forward as a candidate for the nomination for U.S. president. There were other good candidates, with Kucinich the clearest progressive voice. But my hopes went through the ceiling when Obama spoke. A progressive African American for president? About time and more! With Obama, we could not only reject "W's" years of right-wing destruction, we could move the country forward. Then something I had never seen before happened. People surged forward and took ownership of the campaign. The candidate himself encouraged them to do that. He kept talking about "we" and "you" and repeated "It's not about me." People took him at his word. They believed him, and let their imaginations flow. Soon there was a flowering of people's Obama art and music that flooded "You Tube," kept artists busy and printing presses running. Tee-shirts by the millions were silk screened or whatever method is now used. My favorite tee-shirt was the one that said, "We Are the Ones We Were Waiting For." This was the feeling of empowerment that was taking root in working class neighborhoods and communities of color. The coffee shop in my neighborhood, the family restaurant two miles away, friend after friend, were inviting me to forums, phone call parties, debate watching, pizza feasts, most with a television hookup to the national campaign. Strangers visited strangers, and all at once we were not strangers anymore. We were sisters and brothers united in the greatest cause of all—saving our people and our country from the Bush disaster and to rebuild America. By primary time 2008,1 was nearing my 90th birthday. Did I have one more campaign left in my arthritic legs? "Yes," my heart told me, and my legs kindly cooperated. Of course, I could have spared my knees, sat in a chair, and made telephone calls for the campaign. When the votes were counted, Indiana came through for Obama-Biden! It was close. The steel retirees felt that they had made a difference, all of us. We are still celebrating our huge victory. Things have never moved so fast. At this writing, it is only six weeks since Obama took office. We are being swallowed up by the biggest economic disaster since the '30s. And it is beginning to look as though nothing smaller than a new New Deal can help us. How good it is that we have a president who has made job creation a plank of his crisis program. Had we not worked so hard and elected Obama, we'd be under a president who would let the people drown. Meanwhile, Frank spent the campaign in the nursing home. I talked to him about Obama every day. I knew he wanted to know. But I could not tell if the news was getting through to him. The day after the election, the first page of the New York Times carried Obama's picture and his name in three-inch letters. I showed it to Frank. He looked at it, hard. Then he drew his right arm out from under the covers, bent it at the elbow, and raised his clenched fist high! Bea Lumpkin was a strong supporter of Barack Obama. I was immediately attracted to Barack Obama in the 2008 presidential primary. We knew Obama as our Illinois state senator with a progressive record. For me, even more exciting than Obama himself, was the vast network of volunteers who came forward to elect him. I decided to visit the Obama volunteer center in Chicago to see how I could help. I was thrilled to see hundreds of volunteers, almost all in their teens or 20s. Some were at desks but most were sprawled on the floor in comfortable teenage positions. They were calling voters, talking into all kinds of phones and cell phones. I was one of hundreds of thousands who gave their all to elect Obama. 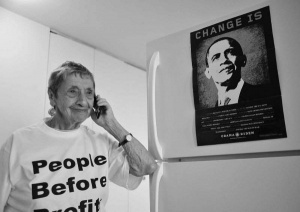 In 2012 Communist Party USA member Pat Flagg and her friend Bea Lumpkin were supporting the re-election campaign of president Barack Obama, through their association with Seniors for Obama. Katie Jordan, and Bea Lumpkin were part of Illinois' seventeen member delegation to the Alliance for Retired Americans Legislative Conference in Washington, D.C. In July 2015, Members of African American Equality Commission CP USA FaceBook group included Bea Lumpkin. Steelworkers District 7 Next Generation hosted programs in several Illinois and Indiana high schools for their Black Labor Week. Next Generation activist Justin Willis invited SOAR members and Congresswoman Robin Kelly to speak at a student assembly at George Washington High School in Chicago. The topic was A. Philip Randolph and organizing the Pullman Porters union: lessons for labor today. — with Justin Willis, Robin Kelly, Victor Storino and Bea Lumpkin at George Washington High School (Chicago). Bea cut her teeth organizing low-wage African-American laundry workers in Harlem and the Bronx during the Great Depression, before the passage of President Franklin D. Roosevelt’s Wagner Act (1935). Bea and her fellow organizers, many of whom were her Communist Party USA comrades, joined the workers on the picket lines where they were beaten by the police and employers’ thugs for daring to demand safe working conditions, fair wages, and an end to the racist practices that had long plagued the industry. 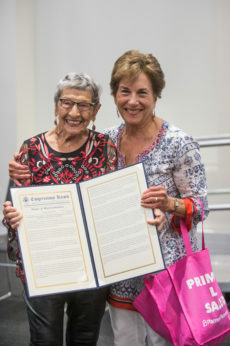 The exploits of Bea Lumpkin first appeared in the pages of the Daily Worker in June 1935, when Hunter College student Beatrice Shapiro was fired from her job after protesting against the visiting ambassador of Nazi Germany. Although deeply immersed in the labor struggles animating the city, Bea still found time to join marches to free the Scottsboro Nine, and rallies protesting Italy’s invasion of Ethiopia. She took the lessons she learned from these battles to every other struggle she would wage, and there were and are so many. Her beloved sons Paul Lumpkin and John Lumpkin brought the crowd to their feet with a personalized rendition of Union Maid. The formal part of the dinner ended with the reading of a letter from President Barack Obama, thanking her for her many years of service in support of the movement. Bea Lumpkin ws surprised as her son John Lumpkin reads from a letter sent to Bea for her birthday by former President Barack Obama.